Officials say the mountain lion is likely the same one that was seen this week in nearby Greenwich. (CNN) -- A mountain lion was killed in a car accident in Milford, Connecticut, on Saturday and authorities say the cat may have been the same one spotted this week in nearby Greenwich. The Connecticut Department of Environmental Protection says it responded to a State Police call about 1 a.m. Saturday morning reporting a collision between a 2006 Hyundai Tucson SUV and a mountain lion in the area of Exit 55 of Route 15 in Milford. 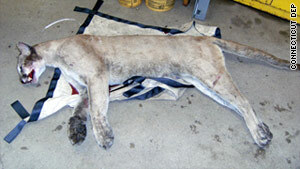 The mountain lion died of injuries in the crash, but the SUV driver was uninjured. Connecticut DEP says it's possible and even likely that the mountain lion killed early Saturday morning is the same cat that's been roaming around Greenwich this month. The animal was last seen Sunday on the campus of a college prep school. The 140-pound male cat is at a DEP facility where his body, along with paw prints and other specimens are being analyzed and tested to determine if it is the same cat seen in Greenwich. There is no native population of mountain lions in Connecticut, the DEP says, and the eastern mountain lion has been declared extinct by federal authorities. They are able to roam long distances, according to the DEP. Milford is about 40 miles north of Greenwich, which DEP says would have easily been within the cat's roaming range.